A big tip of the hat to MKEDP reader Chris, who sent me an email about this billboard at 27th Street and Wisconsin Avenue. The billboard at this spot was removed, revealing a much older advertisment for the Randolph Hotel. The hotel was built in the late 1920's by the Randolph Brothers hotel chain at 4th and Wisconsin. I'm not sure which corner it stood on, but it's a fair bet that the building is no longer standing. By now you probably have heard that the "New Randolph" Hotel came down on July 21st, 1985 when it was imploded at 4th & Wisconsin. 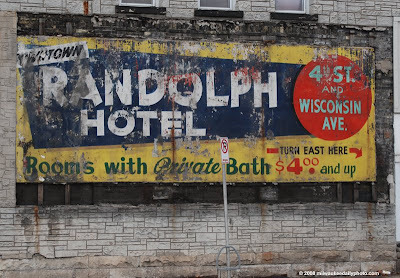 The original Randolph stood on 3rd Street across the alley from the Schlitz Palm Garden. Randolph brothers purchased the old Charlotte Hotel across from the Davidson Theater and renamed it the Randolph. Then later they built the New Randolph at 649 No. 4th St. at Wisconsin Ave. The only reason I remember all this is that on this Sunday morning of July my buddy and I were in charge of the male children in our two families since the wives were at a girl scout camp with the girls. So how do us guys decide to entertain the boys...we got them up at 3 in the morning to go downtown to watch a 14 story building implode! Seems only natural to me! We got separated and I with my son found ourselves at 5th & Wisconsin behind the barriers. With no time to evacuate us the demolition crew gave us hard hats and had us lay down in a pickup truck, less than a block away from where the building was about to come down. Needless to say, we had ringside seats as we watched the cloud of dust come to within feet of where we watched. 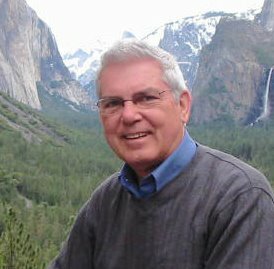 There was an article in the Milwaukee JS the other day showing a picture of the Randolph crashing down.